24 Hour Business Center, Guest Laundry, Coffee. Start your day off with our Complimentary Continental Breakfast. Texas Style Barbeques are available for our guests with dining tables and grassy area. Cable TV with Free Movie Channels, Flat Screen TVs, Fridge, Microwave, Coffee Maker, Hair Dryer. Suites available for our Business and Family Guests with a pull out couch. Situated in Houston, Downtowner Inn and Suites Hobby is close to Glenbrook Park Golf Course and 1940 Air Terminal Museum. Additional area attractions include Almeda Mall and Pasadena Little Theater. Wireless Internet access is complimentary in public areas. There is a 24-hour business center on site. A complimentary breakfast is available. Additional amenities include tour/ticket assistance, barbecue grills, and laundry facilities. Guest parking is complimentary. 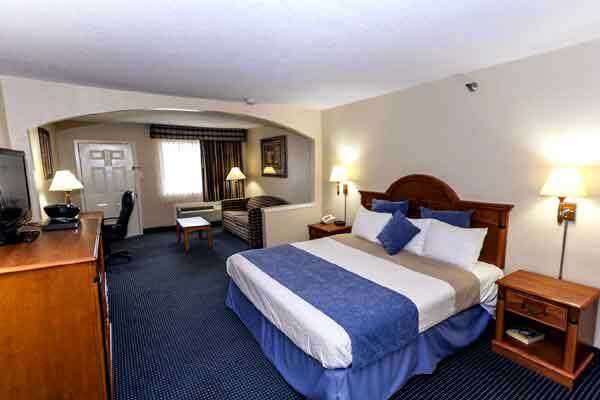 The 47 air-conditioned guestrooms at Downtowner Inn and Suites Hobby include coffee/tea makers and hair dryers. Complimentary wireless and wired high-speed Internet access is provided. 32-inch LED TVs are equipped with premium satellite channels, free movie channels, and DVD players. All accommodations provide desks and phones; free local calls are offered (restrictions may apply). In-room microwaves and refrigerators are provided. Housekeeping is offered daily. Activities : Soak up Houston's picture-perfect weather and get a chance to explore the nature. Houston is an outdoor city. The metro area offers tons of places to get out and experience nature in small ways (an urban downtownpark) and big (a 2,000-acre preserve). Airport : William P. Hobby Airport Our city's second largest airport, William P. Hobby (HOU), has been serving the Houston community for more than 80 years and will become an international airport by 2016. Attractions : Regardless of what your interests are, Houston has attractions just right for you. From Space Center Houston (home to NASA's Mission Control) to the largest Fine Arts Museum in the Southwest, the options are many. Attractions : NASA's Johnson Space Center 2101 NASA Pkwy, Houston, TX 77058 (281) 483-0123 Space Center Houston is the Official Visitors Center of NASA's Johnson Space Center. It's a place where people can experience space — from its dramatic past and exciting present to its compelling future. It's one of the only places on Earth where visitors can see astronauts train for missions, touch a real moon rock and take a behind-the-scenes tour of NASA. Dining : With 8,000 restaurants representing cuisine from more than 35 countries and American regions, Houston's restaurant scene is as ethnically diverse as its more than 4-million residents. With so many options, it's not surprising that visitors leave the city with plenty of good things to say about dining in Houston. Downtown : Downtown Houston is the largest business district of Houston, Texas, United States. Downtown Houston, the city's central business district, contains the headquarters of many prominent companies. There is an extensive network of pedestrian tunnels and skywalks connecting the buildings of the district. The tunnel system is home to many fast food restaurants, shops and services. Golf : With Houston's mild climate, you can hit the golf links 365 days a year. Not far from the city's impressive glass-and-steel skyscrapers are dozens of superb daily-fee facilities, many of which have sprouted like mushrooms in the past few years. Drive in any direction from downtown, and you will find not dead-flat oil fields-the common misconception-but an attractive array of courses set on rolling, wooded land. Government : Welcome to the City of Houston eGovernment Center Here you can apply for a job , pay traffic tickets and water bills , find out about Houston events and the Mayor's Office of Special Events , and learn about the City government that serves you. View the City's Code of Ordinances and the City Charter . See our Houston WiFi site. View our homepage photo archive and send us your favorite photo of Houston! Click rotating graphics above for more about the specific events. Hospitals : Memorial Herman What do we mean by Breakthroughs every day? At Memorial Hermann, it means not being satisfied with the current state of medicine. It means doing all we can to save more lives and improve clinical outcomes. For Memorial Hermann's affiliated physicians, it means tirelessly searching for better ways to diagnose and treat patients while harnessing the latest technologies. For our nearly 20,000 employees, it means exercising uncompromising commitment to deliver the best care possible using the safest methods. For our patients, it means having the best tools to prevent health problems as well as the best chance to regain their health and reclaim their lives following an illness or injury. Shopping : Houston is an internationally acclaimed shopping destination that includes deluxe malls with hundreds of stores, class European-style shopping centers, eclectic shopping districts in historic neighborhoods and bargain filled outlets. University :University of Houston. Every year, students come from around the world to pursue graduate and undergraduate programs at the University of Houston. Stay 2 nights get 3rd free. Free night applies to least expensive night. Stay mid-week and get a 15 % discount. 2 night minimum stay. Higher rates on weekends.